We all have standards to address in the classroom, and we admit that it can be overwhelming reaching all of these in 180 days (even less if you are in a testing grade!). That being said, it is nearly impossible to reach these standards without first focusing on some soft skills. One of the most important of these is active listening. Children are not inherently good at listening to each other. This is a skill that needs to be taught and practiced in order for students to truly master it. When Joe was a teenager, he was a camp counselor. One of the lessons that sticks out the most from the transformative week of counselor training is the concept of SOLER for active listening. This is an acronym for a technique created by author and professional management consultant Gerald Egan. With all the teacher acronyms out there crowding our brains, this is one that is still easily accessed, perhaps due to its simplicity and practicality. Each letter conveys a component of appropriate body language of an active listener. S (Square) - An active listener sits squarely, facing the person speaking, showing an interest in what is being said. O (Open) - Keeping one's body open also shows the speaker that you are ready to receive any information being stated. This means arms and legs are not crossed. L (Lean In) - A slight lean toward the speaker shows that you are involved in the conversation. E (Eye Contact) - One of the most difficult parts of active listening for children AND adults is maintaining eye contact. This not only reassures the speaker that you are interested in what they are saying, but it also helps the listener truly hear and remember what was said. R (Relaxed) - Keeping a relaxed body posture as opposed to sitting or standing stiffly or fidgeting shows the speaker that you are focused. During the first few weeks of school, we go over this acronym daily and remind our students what it means to be an active listener. The most important thing is to model, model, MODEL! We are constantly aware of our own body language when listening to students speak. We show examples of what active listening SHOULD look like. We ask students to role play active listening. One great way to do this is the "Fishbowl Strategy." In this activity, we have two students sit in chairs in the center of the room. The rest of the class forms a circle around them. The pair of students is given a topic to talk about. One student is the speaker, and the other is the active listener. While the students have their conversation, the rest of the class is silently observing the listener. After the conversation ends, we hold a class discussion noting what the listener did well, as well as any possible areas for improvement. The instant, honest feedback helps students quickly improve their listening skills. 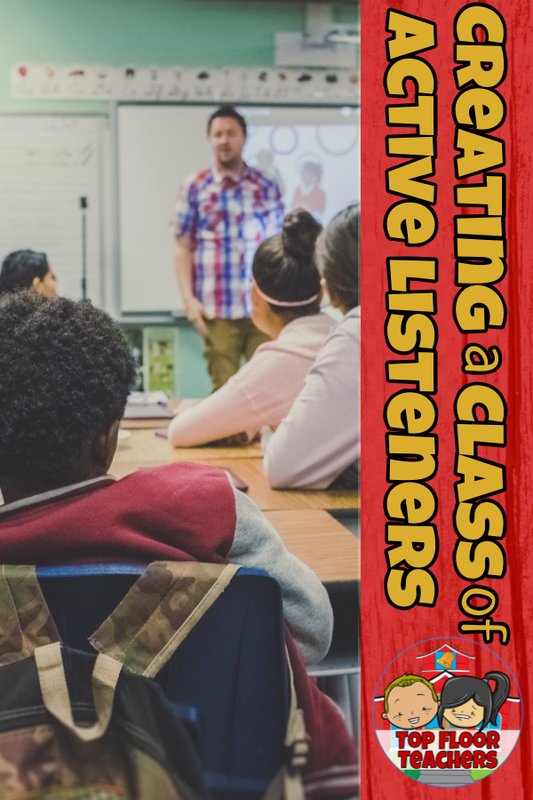 As with anything in the classroom, maintaining the body language of an active listener takes work. However, using this simple acronym from Joe's teenage years has made a huge impact in our classroom. 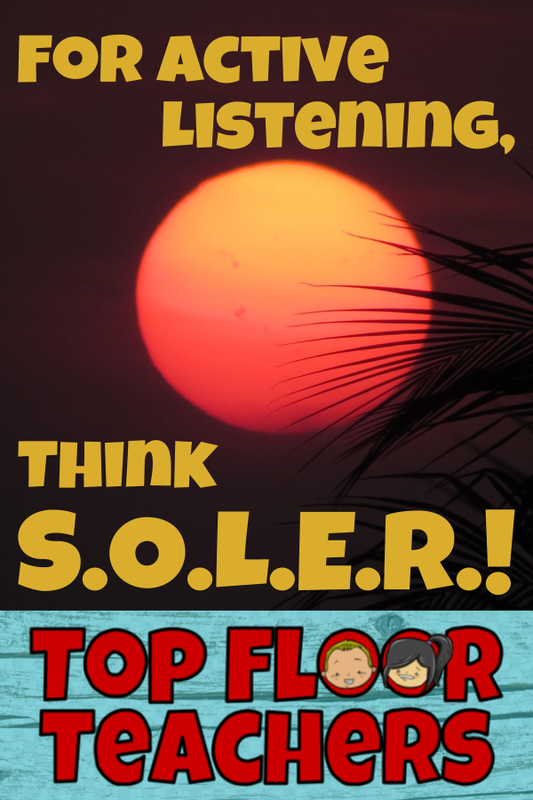 Feel free to download our completely FREE poster outlining the SOLER method to hang in your classroom. We would love to hear how you reinforce active listening with your students. We are always on the lookout for more strategies! The first days of school are a time of excitement and nervousness as both the teacher and students get to know one another. In our opinion, the most important thing to do right away, besides building a classroom community, is to teach routines and procedures. We all have routines. Think about what you have to do each morning when you wake up. You probably have a certain way you do things. You've been doing it so long, that if something changes it would probably throw you off. The classroom can be like this too. We must spend the necessary time teaching classroom routines and procedures so that our students start to do it naturally. 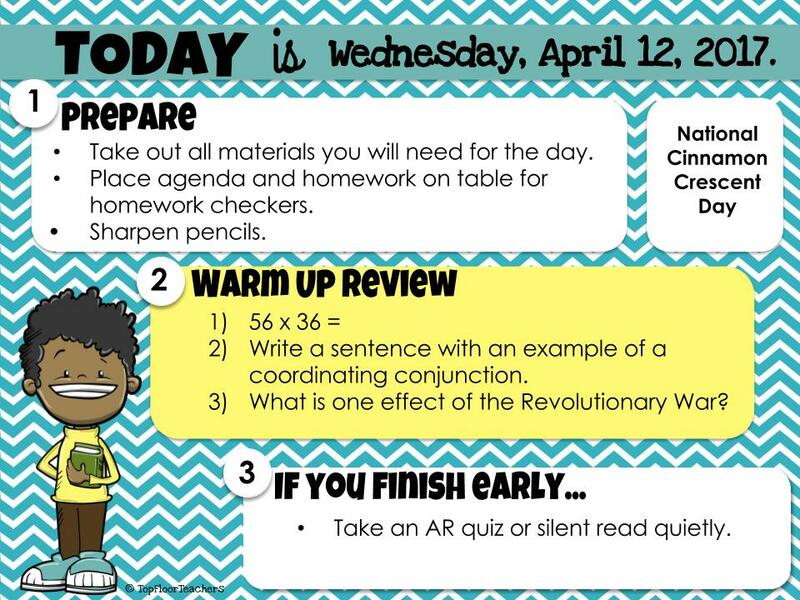 We have found that if you remember 4 important steps, you and your students will have a high success rate with making these routines successful in your classroom. The first step is REASONING. Although this sounds like a no brainer, we often know how we want things done in the class so we just tell the kids this is how it's done. Taking the extra step to explain it will really help students buy in to why they should do it a certain way. For example, when talking about lining up tell students why you want them lined up a certain way. Is it for safety reasons? Is it so you can be more efficient getting to one place to another without wasting any school minutes? The more we tell students WHY we want it done a certain way, they will do it without questioning you. Allow students to also be part of the conversation why it should be done that way. Don't just spend the first days lecturing students on what to do. They will be thankful that they are part of the process. Next is SHOW THEM HOW. 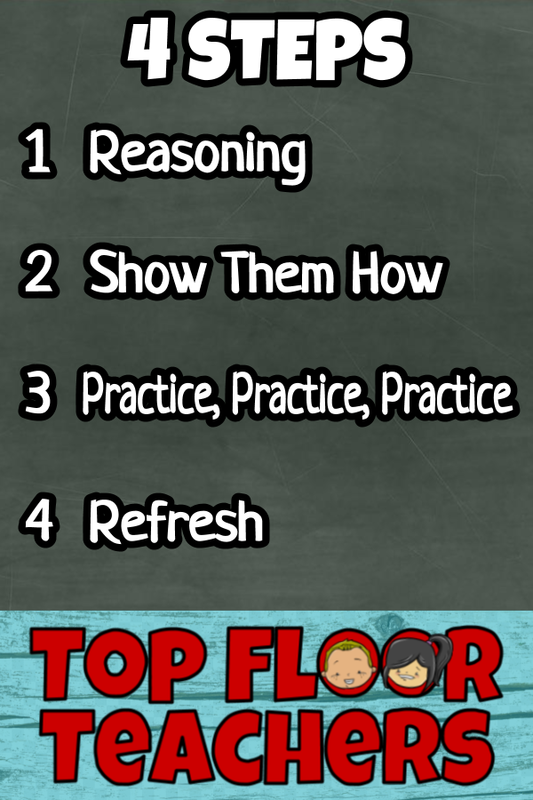 Get students to demonstrate how you want it done and join in! It's always fun when they see their teacher modeling how to do it the correct and incorrect way. They see that you can be silly too. Students also like to model how to do it incorrectly. Be sure to follow that up with many examples of the correct way so they have a good understanding of that routine or procedure. The third step is PRACTICE, PRACTICE, PRACTICE. Students will not be perfect the first day, week, or maybe even month! Give them lots of opportunities to practice and show you how to do a certain procedure. 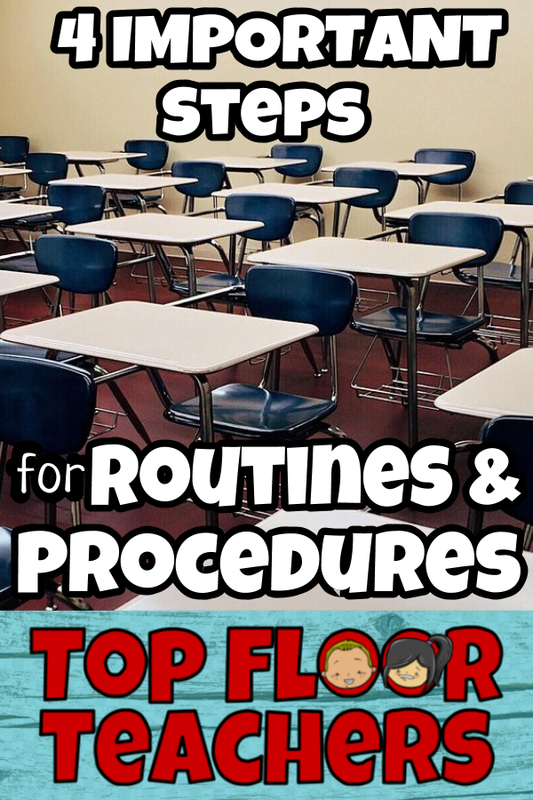 We have to remember that some kids (the older ones) have been through many classrooms with different routines. They've trained with that teacher all year and now they have to relearn new routines. If you feel a routine needs more time, give it more time. Let your class guide you in how much time you need to practice. The last step is REFRESH. This step often gets forgotten. It isn't forgotten because the teacher doesn't care about it anymore. It is forgotten because it may happen later in the year when we assume students know what is expected. You might start noticing the same student forgets the same procedure each week. Take that as a sign that you need to go back and refresh the procedure for everyone. Try not to call out that student and make them feel embarrassed. Go back to reasoning and repeat the steps. It might sound redundant, but some students just need to be retaught how to do a certain procedure. In addition to refreshing students' memories, make sure you stay patient. It's easy to lose our cool because we've been sounding like a broken record, but a quick refresh can help make the year run smoothly. 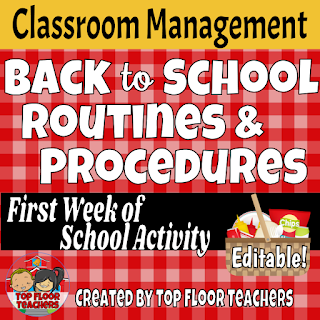 In our classrooms, we always start the year by playing a little game with procedures. We call it, "Going on a Picnic". Essentially, each student has a card faced down on their desk. On each of these cards, we have listed a different procedure. We tell the students not to look at their card. We tell them they are going on an imaginary picnic. In order to attend they must bring a very specific item. It's a secret as to what item is correct for them to bring, but they need to choose an item with the same letter as their first name. For example, Sally can bring sandwiches or any "s" letter item. As volunteers start choosing the right item, you tell them to flip their card over. The card may say "bathroom". This is when you will start talking about your restroom procedures. After you teach this, another student can volunteer to join the "picnic". Eventually, students start to figure it out. Some might not, but encourage a growth mindset before giving them some very helpful hints so they can get it as well. It's an easy game, but the kids always love it! You can easily write them on index cards and save them all year or if you want a cute template with picnic backgrounds, we have already made them! You can check it out in our TeachersPayTeachers store. We include a reflection and some editable templates to save you time! We want to hear from you! How long do you spend teaching routines and procedures? No matter what year of teaching you are in, we are all in the same boat during those first few days. We all feel it. Summer is approaching, state testing is looming, and everyone in the class has a case of spring fever. Rather than trying to fight against the excitement that ensues with the end of the year, we have fully embraced it. We have found a way to take the end of year craziness and focus it on some fun, enriching activities that continue the rigorous work we have been completing throughout the year. The best part is that it is all disguised as fluffy year-end fun so the kids have total buy-in. We realize we aren’t the only people to use a summer countdown in our classrooms. However, rather than simply counting down the last week or ten days, we extend our countdown to the final 26 days of the school year. We know, we know. It sounds a bit crazy to start counting down to the end of the year with five weeks left, but our countdown is thematic so the kids remain focused and excited for each new day throughout the entire countdown. We celebrate the end of the year by celebrating the ABCs of College Degrees. This truly becomes a fun unit in and of itself, simultaneously providing engaging daily activities and giving students a glimpse at the educational opportunities available in college. The countdown kicks off with the students each receiving their acceptance letter to Endoyear University. We hold a big acceptance party where we celebrate everyone’s acceptance into this “prestigious” program. From the letter they learn that they will be earning a different college degree each day through the last day of school. Already the students begin to look forward to seeing what their first degree will be. Each day we unveil the subject of the day, beginning with A for Advertising and working our way through the alphabet. By Day 3 we have students betting against one another over what degree will be earned for the letter F or L or Z. The best part is that the class isn’t able to earn the degree until the activity is successfully completed. 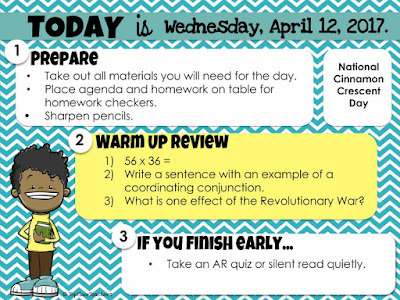 This keeps end-of-year silliness in check and keeps the students focused on completing work. This activity can easily be done in any classroom at any grade level. Simply think of a college subject and come up with an activity that corresponds to it. We have provided a list of some ideas we have come up with over the years. Click on the image below to see what we came up with. We are sure you can add many more to this list! To make life easier on you, we have put together a bundle of certificates that cover a variety of subjects. Many letters have multiple certificates to fit whichever activity works for you in your classroom. Even better, we have provided a link to a Google Drive resource that is completely editable in case there is a specific subject area you would like your kids to study that is not included in our bundle! 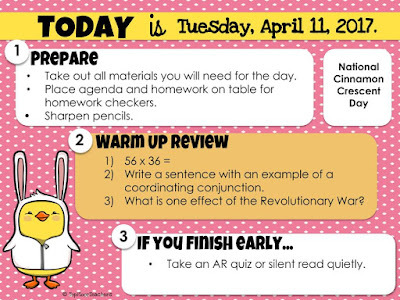 We have also gone ahead and created an activity for each day, so implementing this in your own classroom is as simple as hitting print! If you are interested in checking out this resource, you can click HERE to find it our TpT store! Let us know below what activities you do to countdown to summer! We love to use picture books in our classroom. We are firm believers that you are never too old to learn a good lesson from a picture book. Roller Coaster by Marla Frazee is no exception. While the concept and text of the book may be simple for 5th graders (it is about a girl's first thrilling ride on a roller coaster), we are able to get a couple week's worth of writing instruction out of it! We have to admit, this idea was inspired from a training we attended about integrating visual arts into literacy instruction. One great way to get students talking about art is to have them study illustrations in picture books. Marla Frazee is an amazing illustrator, and the facial expressions and subtle nuances of her pictures make for great art pieces to look at closely. To begin this lesson, we don't even have the students read the text in the book. Instead, we choose one set of thrill seekers to follow page by page. For example, there is an elderly couple that is riding the roller coaster together. We have the students focus just on the facial expressions of this couple as the story progresses. Students then choose another duo to study from beginning to end on their own. After getting familiar with the different characters in the book, we then lead a class discussion on character traits. The students have a fun time thinking of traits for each set of characters, especially because looks can be deceiving with this set of riders! Several character pairs go through a character shift over the course of the book which also helps with understanding sequencing. We like to record this class discussion as an anchor chart for students to refer back to in future lessons. The next lesson we do focuses solely on dialogue. Students are encouraged to imagine the conversations the character pairs have with each other before, during, and after the ride. They use the illustrations, as well as the character traits listed in the previous lesson, to come up with realistic dialogue for their characters. Again we like to model with one duo, giving us the opportunity to explicitly teach grammar rules related to dialogue. Students then move on to independent work using a character set of their choice. Finally it is time to take what they have created thus far and turn it into a complete narrative writing piece. After modeling the components of a narrative that are expected at their grade level, students are given the opportunity to write their own stories from the perspectives of their chosen characters. 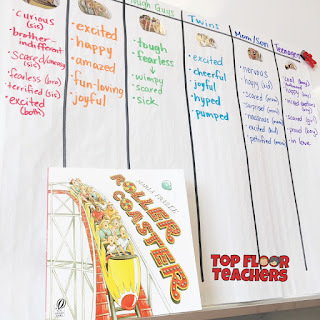 As we all know, and as Marla Frazee makes perfectly clear with her wonderful illustrations, we all have different experiences on roller coasters, and the stories that come from this activity certainly reflect that. Of course, after all of their hard work, we do end up reading the text to the class. We then like to compare the story the author wrote to the ones they came up with to look for similarities and differences. This book also does a great job of showing how authors and illustrators use font size, color, and shape to help tell a story. We were amazed at how in-depth our conversations with our students became as a response to this book. Do you know of other picture books that would lend themselves well to this kind of activity? Let us know! If you want to use this book in your classroom, here is our affiliate link! By purchasing from this link, we earn a small commission. Why is homework synonymous with a feeling of dread? We have both had our share of parent concerns over the past decade regarding stress with homework. We have noticed that across the nation, teachers are starting to become more aware of this fact and cutting down or eliminating homework. For us, we agree that our students work extremely hard during the day and homework can be seen as a chore. 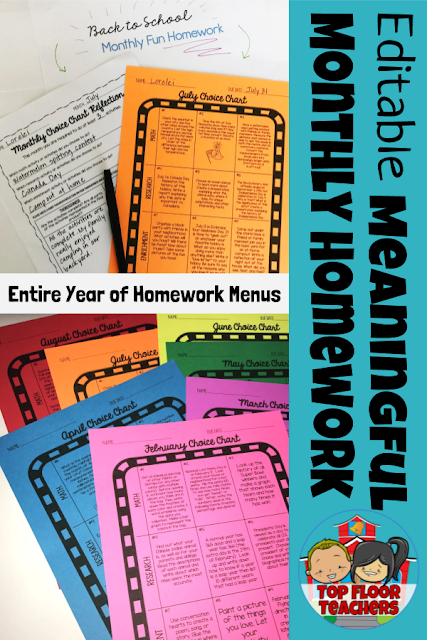 How can we make homework seem more fun and meaningful? How can we get parents involved without the fighting and crying? We decided to create a monthly choice chart that would include math, research, and enrichment opportunities. 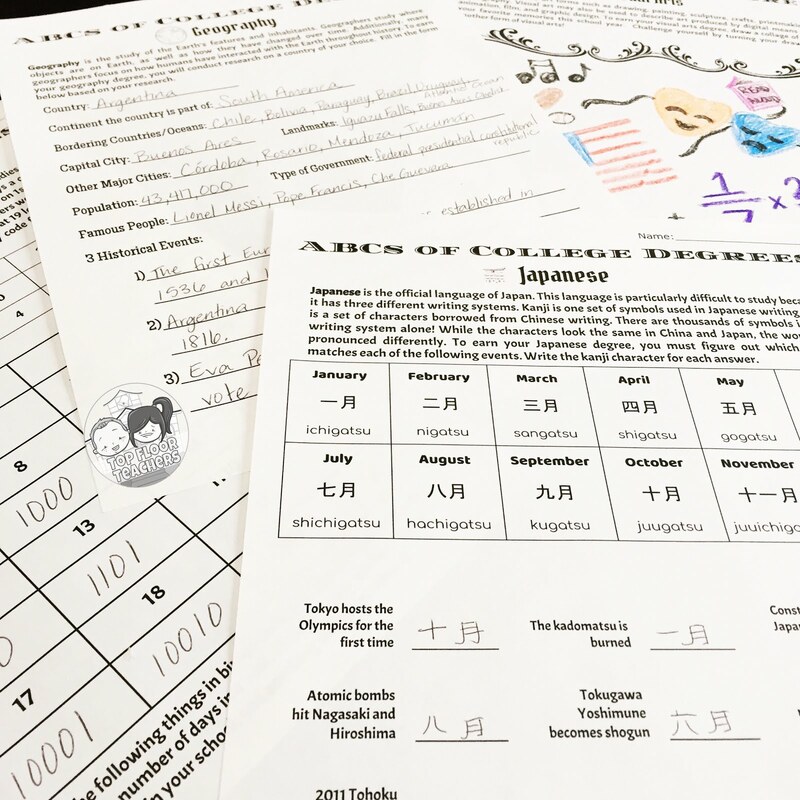 For our 5th graders, we still wanted to teach responsibility and accountability without the monotonous review worksheets. We created a reflection form that would be used for each month where the students would write a little about what they took away from each activity. The feedback from our students and families were overwhelmingly positive! Below is one of the comments a parent shared with us when she posted about her son baking a pie for homework! It felt as if a lightbulb had gone off when our kids were begging us to do more than the minimum we asked. They were doing engaging and meaningful activities at home related to math, reading, and writing. As an added bonus, we received a lot of pie samples for the September Choice Chart! We have created an entire year’s worth of monthly choice charts and each one is centered around what happens in that month. 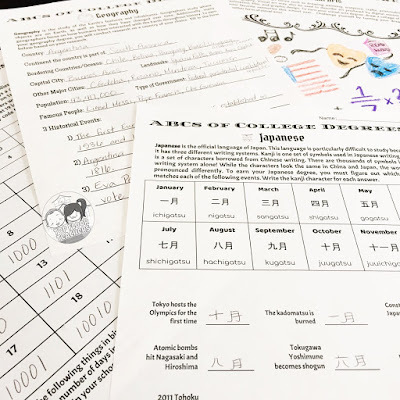 Since our school still gives an effort grade on homework for report cards, we also gave students feedback forms which easily gave them some feedback from us. We usually had a huge share out at the end of each month and let the students talk about what they learned (great for listening and speaking skills!). We’d love to share our September Choice Chart with you! It’s a great Back to School “homework” for the new year. Our personal favorite for this month is the one where they interview a grandparent. They ask about what life was like for them as a child and so many parents and kids loved this one. One of our students created a Google Slideshow about his grandparents and learned so much. Click the link below for a free copy of our September Choice Chart. If you enjoyed this and would like a whole year’s worth of fun homework, please check out our product where we include the self reflection form, teacher feedback form, and all the months including an editable file in case you need to make changes to suit your class. We’ve taken the “work” out of homework and made it fun! 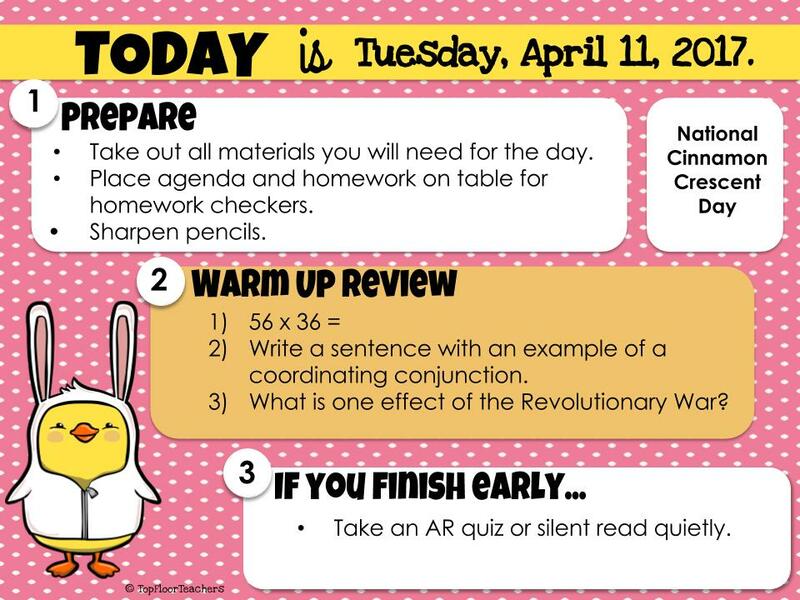 Please comment below and let us know what you are doing for homework in your classrooms! CLICK HERE FOR THE ENTIRE PRODUCT COMPLETE WITH EDITABLE FILES! We recently took a course from Tabitha Carro at FlapJack Factory. Our friend and colleague, Kristen, at Easy Teaching Tools recommended that we try it out and we were not disappointed! One of the templates we loved was the morning work and morning routines slides. We usually have the same morning routine each morning, but still get asked daily, “What do I do now?” or “What do I do next?”. For days where we have lots going on (you know those days with field trip permission forms, money collection, etc…) these slides are helpful in giving our students a visual! The middle box on the template is nice as a morning review. We like to spiral different subjects we have taught as a quick check in and it makes great daily practice. We choose whatever it may be that the kids need to do. It could be a quick math problem, or even a quick question from Social Studies or Science. The kids do this in a morning routines composition book and can check with a friend or you can go over it after you take attendance. Speaking of attendance, these slides are sure to help us remember to take attendance! We are guilty of forgetting and that is usually because we are answering questions about what to do in the morning! The last little box we added to our template is a small section in the upper right hand corner that allows for fun facts. It could be a student’s birthday or a fun day such as “National Hot Dog Day”. It could also be an open ended question such as, “How will you be kind today?”. This little box is meant to be used for whatever your heart desires! If you want to try it out, click the link below for a FREE sample slide! We have created over 50 slides and 6 themes to use year round! You can find these in our TpT store or by clicking HERE. Have you ever read The Invisible Boy by Trudy Ludwig? It is a heartwarming picture book about the power of kindness. Brian is a kid who feels invisible at school. Always being left out and looked over has taken its toll on the little guy. When a new kid moves to school and starts paying attention to Brian and his talents, Brian’s world becomes a bit more colorful. Reading a quick blurb online made us quickly realize this was a must-have read aloud for our classes. Our school is participating in a two-week Kindness Challenge, during which students are inspired to partake in various acts of kindness. On top of this, our school has had a particular focus on kindness throughout the year in hopes to create a positive school culture of mutual respect for one another. This book just seemed to lend itself so perfectly to our discussions of empathy and kindness, so we had to try it out and see how our kiddos responded to its message. We invited our 2nd Grade Buddies over to our classroom for the read aloud. The discussions we were able to have during and after the reading were awesome. So many of the students, 5th and 2nd graders alike, could relate to the feelings Brian had throughout the book. And it was so clear to the students that all it took was one person’s kindness to turn his world around. We wanted to take this discussion a step further so that the students could really visualize how others’ kind words and actions can positively impact our lives. To do this, we gave each child a black and white image of a child and had them write down when they felt invisible themselves. Examples ranged from not being invited to a birthday party, to friends not waiting for them at recess, to parents giving more attention to a brother or sister. Not only was this a good reflection for the students to get in touch with their own feelings, but it gave us as teachers an insight into what is going on in our students’ worlds emotionally. But the truly powerful part of this activity is what came next. Each child then took their paper and read it to someone else. In response, the other student would use their colored pencil to write a word of encouragement or a kind deed to help the student feel more visible. Then using the same colored pencil, they would color in a piece of their picture. Students walked around from peer to peer, gaining words of encouragement and quickly getting their pictures completely colored in. The final product was a colorful page full of kind words all directed to each individual student. What a great personal keepsake for the kids to look back on whenever they start to feel invisible in the future. We can’t wait to do this activity again next school year! 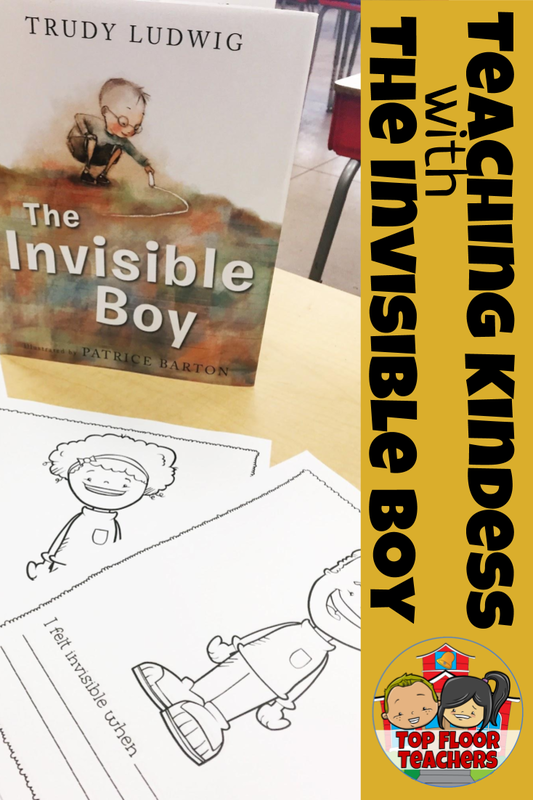 If you’d like to try it out, here is a free sample of our Invisible Boy Worksheet. 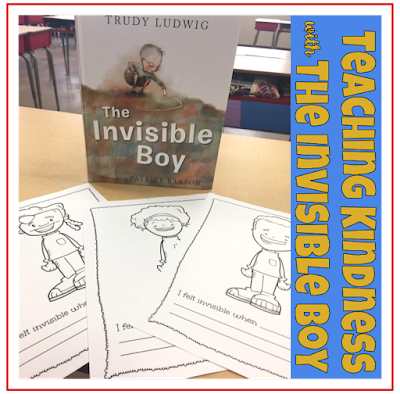 To download the entire pack with a variety of kids to meet the needs of the students in your class, visit our TPT store here or visit bit.ly/invisibleboyreflection. Let us know how else you have incorporated this book into your classroom. We would love to hear about it! Blogging from the Top Floor! Super Bowl Activities for the Classroom! 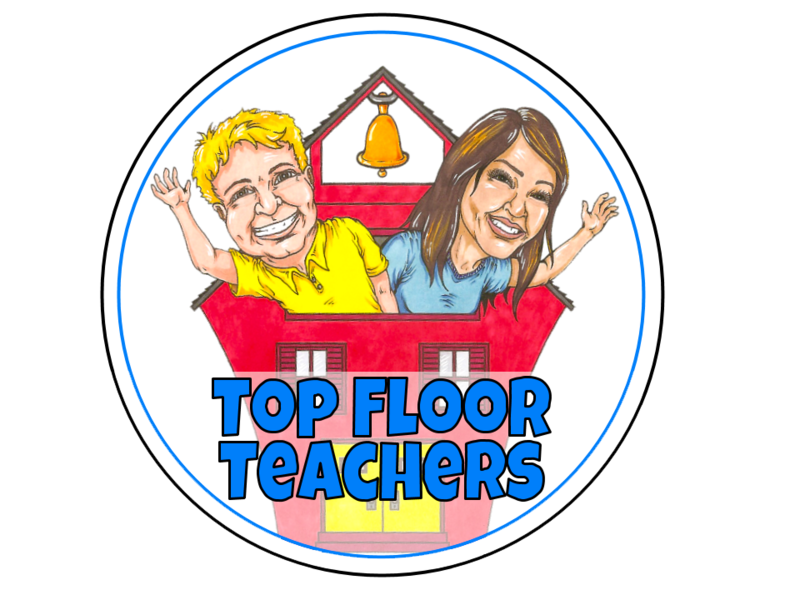 © 2015 Top Floor Teachers. Felicity Template designed by Georgia Lou Studios All rights reserved.